Vintage Travel is delighted to welcome the incredible villa known as Mirage to its Turkey programme. This stunning property is located in the ultra-desirable spot of Kas, which is becoming an increasingly popular holiday town. Mirage is a spacious and airy villa, which, with four bedrooms and four bathrooms, can sleep up to eight guests in comfort. Situated in an elevated position, overlooking the sought-after Kas peninsula, Mirage enjoys spectacular views, stretching across the Mediterranean Sea and out towards the hills that surround the nearby bay. Mirage is decorated and furnished to an extremely high standard. The villa’s high ceilings are adorned with polished vaulted wooden beams, which face an equally polished wooden floor. The property’s impressive living room is huge, stretching the width of the entire villa. Being furnished in a minimalistic style really augments the appealing feeling of space in this impressive living room. In fact with a ‘home theatre’ system, Wi-Fi and satellite TV, it could be easy to get a little too comfortable in this fabulous living room. The bedrooms, three of which are en-suite, share the spacious and meticulously furnished appeal of the living room. As does the kitchen, which radiates a contemporary design that gives guests plenty of opportunity to cook to their heart’s content in comfort and ease. Despite its polished, meticulous and spacious design, tasteful, colourful and well placed artwork introduce an element of quirkiness to this beautiful villa. On the landing of Mirage’s first floor, guests can step out onto the panoramic terrace, designed to make the most of the incredible views that surround this villa at every angle. In fact Mirage is understandably designed to make the most of the fantastic scenery that surrounds it. 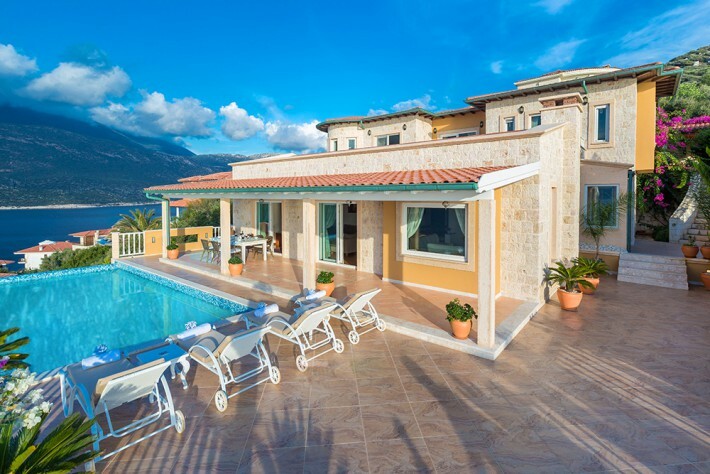 Outside a large sun terrace lies adjacent to the villa’s beautiful infinity-edged private pool in which bathers can enjoy swimming whilst looking out towards the azure waters of the sea below and the pretty bay the crystal clear water laps. Other external delights include a barbecue, shaded dining terrace and a sun terrace, where guests can soak up the enviable sunshine this part of Turkey is home to, as well as the fabulous panoramic scenery. If you can bear to drag yourself away from Mirage, you won’t be disappointed. The traditional and friendly town of Kas is just 5.5km from the house, where narrow lanes framed by sweet-smelling jasmine and squares lined with characterful tavernas, craft a pleasant and vibrant atmosphere in this laid-back Turkish town. For those seeking adventure, the area really takes advantage of its waterside location, with yachting, kayaking, scuba diving, boat trips and more available during peak times. For more information, to view photos and for availability and pricing, visit Mirage’s official webpage.